Chinese New Year is days away! Many would have returned to their hometown for the Reunion Dinner on the eve. The same can be said for me. In the old days, when we used to 'open' house, there would be a rush to order festive cookies and stock up on tidbits. A practice known as "open house" (rumah terbuka) is common during the festivities, especially during Hari Raya Aidilfitri, Deepavali, Chinese New Year, and Christmas. Open house means that all well-wishers are received and that everyone, regardless of background, is invited to attend. Kuih bahulu, kuih kapit, semperit cookies, pineapple tarts, kuih makmur, mini popiah rolls and prawn crackers were annual favourites. 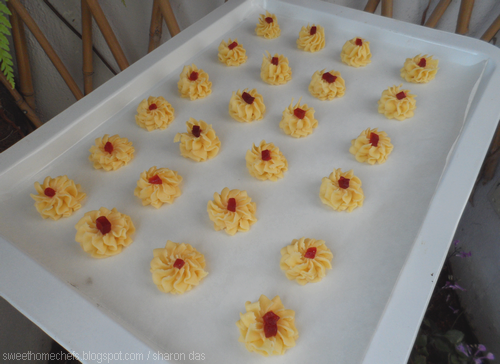 Other than Kuih Makmur, I've never tried to make any of the rest. It happens to be my favourite ~ not only as a nice treat, but also because makmur means 'prosperous' in Malay. Anyway, I was motivated to bake these cookies after the girls in our Facebook cooking group invited me to join their Chinese New Year marathon baking adventure. I chose Semperit Cookies because I find it pretty, and although this is supposed to be in pandan green (following the recipe), I chose to go with no colouring and just a red bit of glace cherry on top. This is how I've always remembered it in my younger days. This recipe is adapted from Kuali and Resepi Planta (video). Changes made: Omitted the use of colouring, glaze and dragees. 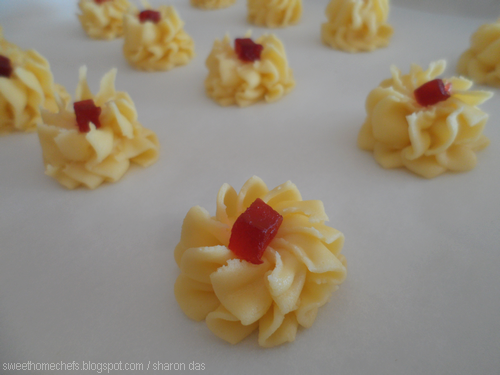 Decorate with glace cherry. 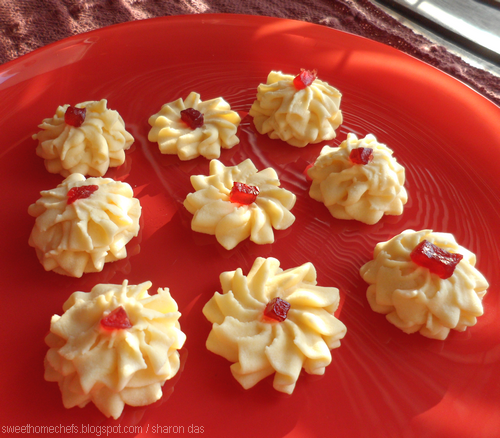 1) Using an electric mixer, beat margarine and icing sugar until fluffy. 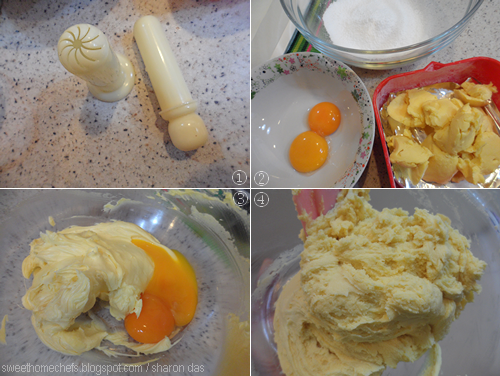 2) Add egg yolks. Beat until combined. 3) Add pandan essence. Mix well. 4) I used a baking spatula for this one. Add all the flour in, in stages. Mix until combined. 5) Line baking tray with baking paper. 6) Fill cookie piping syringe (pictured below) with dough. 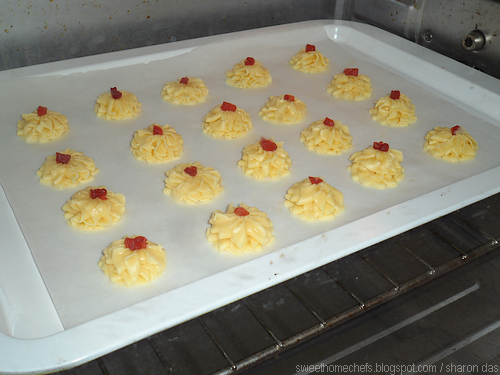 7) Bake in a pre-heated oven. Do a test bake. 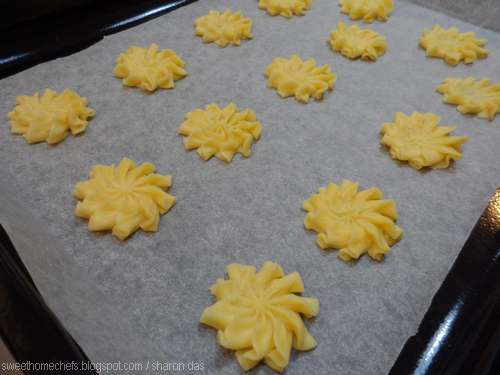 Bake time for my oven: 14 minutes at 148C for double layered flower cookies. Single layer, about 10 mins. Leave on baking tray for about 5 minutes before removing to cool completely. Cool and store in an airtight container. It lasted well over two weeks for me. 1) Cookie piping syringe. Nozzle with a twist! 2) The ingredients. 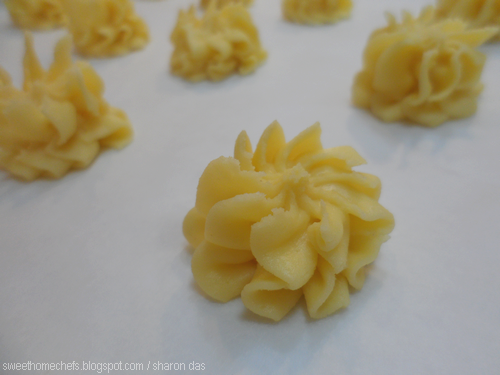 3) Beat icing and margarine until fluffy. Add eggs. 4) Added the flour. Phew! Tiring. Pump out, twist and press down a little. Repeat on top and break (Flower 1). Place the syringe near the baking tray. Pump and let the dough ooze out from all sides. Break (Flower 2). Semperit Pandan Cookies redy to go into the oven. The dough begins to melt a little. Semperit Pandan Cookies fresh out of the oven with nice folds. There you go, an easy-to-do festive cookie for the New Year. 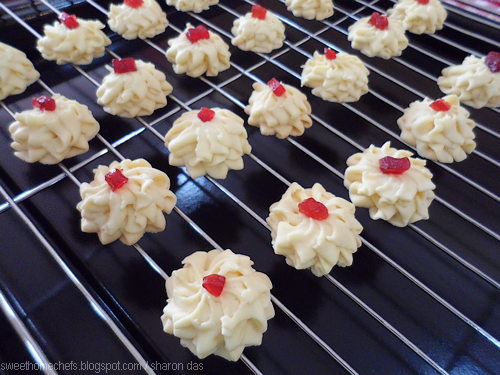 Semperit Pandan Cookies ..nom, nom! 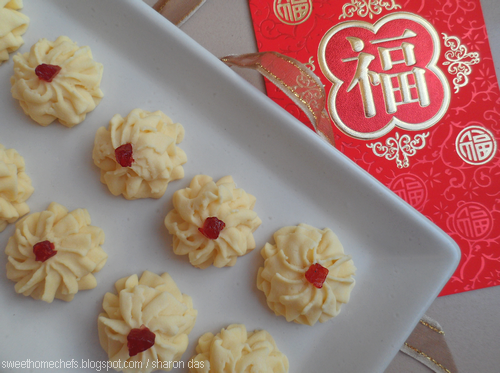 With that, we at Sweet Home-Chefs wish you Gong Xi Fa Cai! Oh, your cookies are beautiful! Wow! So cute looking cookies and very professional too! Lovely. I love this cookie! These are so beautiful Sharon! The piping tool makes all the difference and that cherry too!! Wish you a very happy CNY! The cookies turned out beautifully! So pretty and I bet they taste so good too!